News of the tragically accidental death of David G. Hartwell left the SF writing and publishing world reeling with the shock. I first learned about his accident from a brief post on Facebook on the evening of his fall, and realized that any chance of recovery was slim. Yet we continued to hope. It’s no exaggeration that I had trouble sleeping that night, and equal difficulty concentrating on anything the following day. Our SF family was sharing in the vigil. Wednesday night, after my weekly community choir practice, I immediately checked my phone’s Facebook app to see the sad news of David’s passing. Even when I’d expected the news, reading the words on the screen made me feel like I’d been hit with a blunt object. Almost immediately, the tributes to this amazingly intelligent, noble, always charming, kind and generous man began to appear on personal blogs, websites and all manner of social media. Some people had been lifelong friends and professional colleagues, and others may have had just a brief encounter with David when he stopped by to visit their dealer table at a convention, to chat about the genre they both loved. I knew David casually, and was constantly in awe of the fact that he actually knew who I was. He always showed a professional courtesy to me and my On Spec colleagues as fellow editors, and that meant a great deal. Some famous folks will only give the time of day to other famous folks. David was not one of those. When he spoke with you, he engaged with you fully, and was happy to be there in the moment, and not looking at his watch to see how quickly he could leave to go see someone more important. David was, as they say, the genuine article. Yes, he knew about On Spec. In fact he became a champion of Canadian Science Fiction and Fantasy literature at a time when our little writing and publishing community was just beginning to spread its wings. 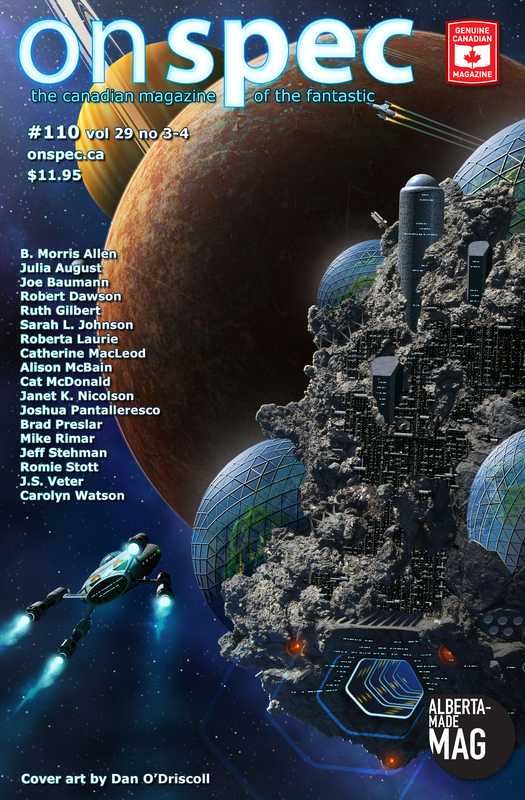 He read the review copies of On Spec that we sent him, occasionally selected one of our stories for his annual “Honorable Mentions” list in the “Year’s Best” anthology, and above all, he paid attention to what our home-grown writers were saying. And when he edited their work he made sure he brought them to the attention of the rest of the world. David wasn’t a writer, but he sure made writers look good. I saw David at last year’s World Science Fiction convention in Spokane, and like the rest of us, assumed there would be many more conventions before he hung up his plaid jacket for the last time. He will be missed. Previous PostPodcasts for Writerly TypesNext PostOn Spec at VulCon 2016!